It’s not hard to answer. This flooring product offers many features and benefits to the home. And, perhaps, to your home. 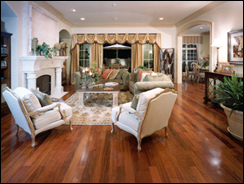 The elegant look of a hardwood floor can add warmth and character to any room. In fact, the natural characteristics of wood add depth and a visual appearance that many other types of floors try to duplicate. Running the boards on the diagonal, or creating a border are just some of the design styles one can consider. Today you can choose between a pre-finished hardwood floor and one that is unfinished. Pre-finished hardwood comes ready for installation in your home. The hardwood boards have already been sanded, stained and finished at the manufacturing plant. In many cases this can provide a harder, better-protected surface. There are two cutting processes. “Sliced Cut” shows a more uniform pattern, whereas “Rotary Cut” displays a larger and bolder graining pattern. graining pattern. Now don't forget, you're not finished yet. You should be aware that there are different types of finishes depending on whether your hardwood floor is pre-finished or job site finished. In general, lower gloss levels are better suited for active rooms. This is because lower gloss or matte finishes help minimize the appearance of dirt and scratches. Consider the elegant look of the high gloss finish for a more formal decor. By using ultra violet lights, the pre-finished wood planks can have several coats of urethane applied within a matter of a few minutes. This is helping make hardwood floors both more affordable, and much easier to maintain. Recently, the hardwood flooring manufacturers have began to add small chips aluminum directly to the floor’s finish which dramatically increases the life of the urethane finish.